It’s hard to imagine that Candy Crush was released six years ago and still haunts our phones to this very day. The game may have lost a lot of its popularity compared to the beginning, but it’s still very much alive, much like King’s other games that have since then been released. The original game was only available on Facebook and later invaded our phones and now it actually got turned into a board game, which sounded very interesting on paper but left a lot to be desired when we actually got to play the game. This Candy Crush quickly turned into a Candy Crash that feels like King just wanted to milk the cow dry. The board itself and the tokens look quite true to the source material, and thus they represent the playing field as it looks in the game, albeit divided into four segments for a maximum of four players, and the tokens in turn represent the candies the original mobile game has. You’ll have six different colors to choose from, as well as their ‘special’ counterparts, which will be explained below. The six dice added to the game look quite spiffy and are the only thing that actually stands out in the whole package, as they aren’t normal dice, but they have the shapes and colors of the different candies on them. One remark goes out to the fact that you have to sort all the tiles from the same color and type before you start playing. Sadly, the game does not come with Ziploc bags, making it quite a hassle to keep things separated, meaning the preparation of the game can sometimes take a lot of time. 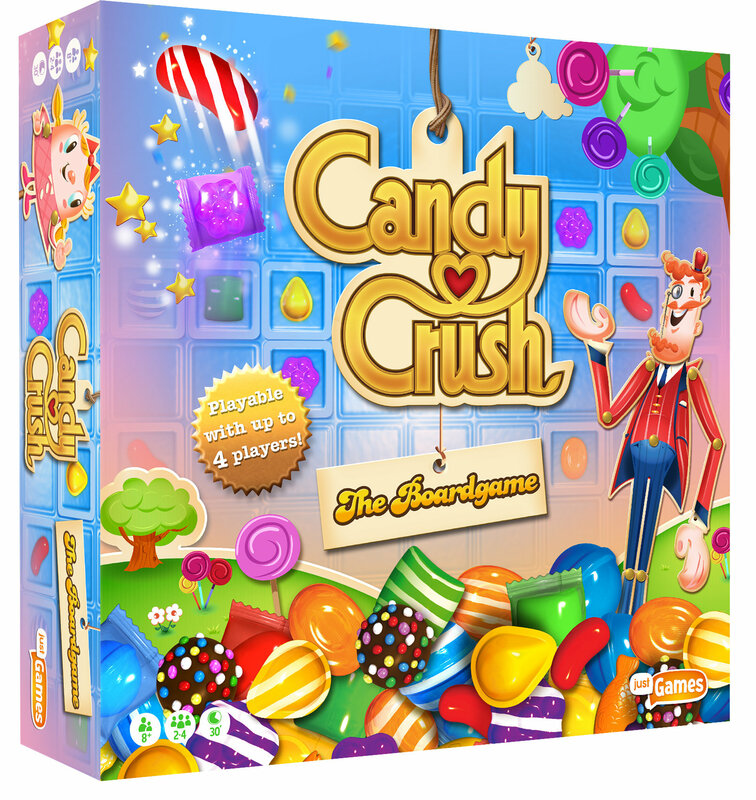 Candy Crush: The Boardgame is a translation from a mobile game to a board game, where you’ll have to compete with other players by linking candy to each other to reach the cherry candy on your playing field. Earning candy is done by throwing the six dice and matching the proper symbols to one another. This happens according to the principle of Yahtzee where you can do three throws in a row, with the dice of your choice, allowing you to pick which combination you wish to aim for. Each player has his/her own playing field, where you start off with candy, and you can only link the candies you earn in a horizontal or vertical line next to the candy that already is on the field. You can also do this on your opponents’ fields to hamper their movements, or to create a three in a row of a candy type to remove them. Special candies can remove entire lines from the field, other remove candy in a plus shaped size, and you also have a candy piece that removes all the candy of a specific color. Last but not least, you can also earn chocolate which can block certain connections, making it harder for the other player(s) to reach their goal(s). Sadly, you can’t place these special candies anywhere, as there are a lot of restrictions on the tiny playing fields. This causes a lot of the special candies to be useless, making it hard to thwart the plans of your opponents, making the game a lengthy and tedious contest to finish first. The game could have been better if it followed the rules of the original game, where special candies could also be combined with one another, making it easier to frustrate your opponents and stop them in their tracks. Sadly, this is not the case, but the game rules do state that you can ‘make up your own rules’ which sounds like a poor attempt of not having the rules it should have in the first place. Most things about this game feel rather lazy and not thought through. Well, the game does possess a hefty dose of strategy, within the confounds of the game, that is. 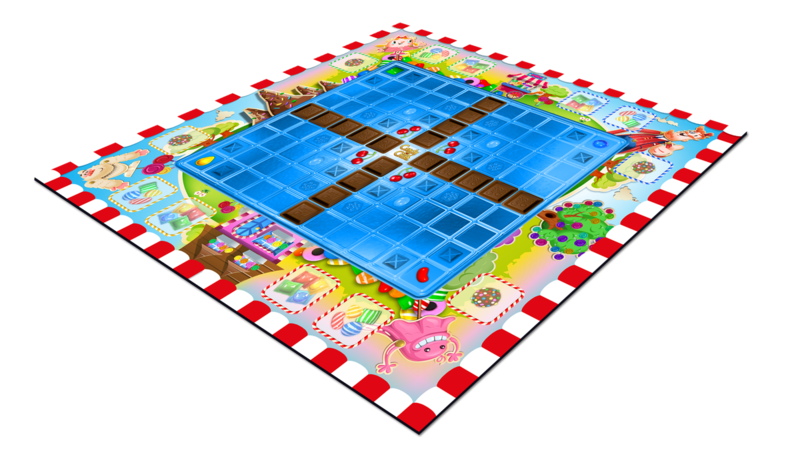 Depending on your luck during a dice roll, you’ll get your candy or different candies, which you can place on your playing area(s) or those of your opponents. Sadly, because of the tiny playing fields, especially when playing a two player game, it’s actually nearly impossible to pester your opponents, making it a somewhat boring struggle to reach the finish line. Overall, the game states you can adjust the rules to your liking, which could allow you to make the game more true to the original, by being allowed to combine special candies in a fashion like the mobile game but it shouldn’t be up to the player to make a game more exciting for it to be actually, well, exciting. The game becomes more fun and tactical when you play with a full house, aka four players, but still it leaves a lot to be desired. 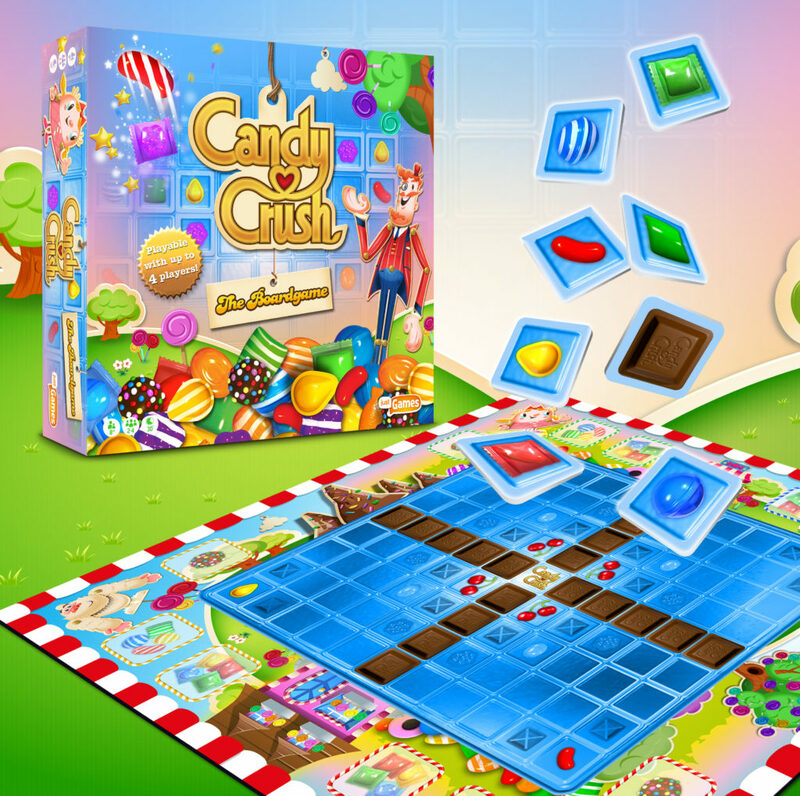 Candy Crush: The Boardgame is one of those games that should have never been created. While the overall concept is actually fun, the execution is nowhere close to a term that relates to the word fun. Even with the maximum amount of players, you’ll be treated to a snorefest that turns into a skirmish to finish the game as quickly as possible, to throw everything in the box and actually choose a decent and more fun game to play. Not everything is bad, but the game feels like a poor attempt to make Candy Crush more relevant again.